ling in their area or sonic booms of low flying jets. Over 40 years of Israeli military occupation have had a devastating effect on Gaza; airstrikes, artillery shelling, ground invasions, jet flybys and their sonic booms have all led to an epidemic of suffering among Gaza’s most vulnerable inhabitants. Soon after the recent winter Israeli assault, a group of scholars at the University of Washington discussed different aspects of the situation in Gaza and the occupied Palestinian Territories. Dr. Evan Kanter, UW school of medicine professor and the current president of Physicians for Social Responsibility, delivered a somber talk describing the mental health situation among Gaza’s population. Dr. Kanter cited studies that revealed 62 % of Gaza’s inhabitants reported having a family member injured or killed, 67% saw injured or dead strangers and 83% had witnessed shootings. 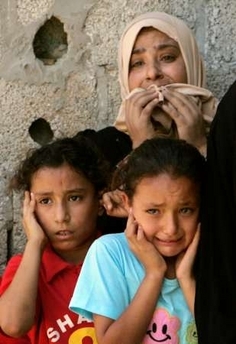 In a study of high school aged children from southern refugee camps in Rafah and Kahn Younis, 69% of the children showed symptoms of Post Traumatic Stress (PTS), 40% showed signs of moderate or severe depression, and a whopping 95% exhibited severe anxiety. Seventy percent showed limited or no ability to cope with their trauma. All of this was before the last Israeli invasion. Dr. Eyad El-Sarraj, head of the Gaza Community Mental Program, and whom Dr. Kanter described as a “medical hero” working under seemingly impossible conditions, has produced “some of the best research in the world on the impact of war on civilian populations.” In a 2002 interview he said that 54% of children in Gaza had symptoms of Post Traumatic Stress, along with 30% of adults. The hardest hit were young ones who had their homes bulldozed or who lost loved ones like their mothers, he said. Again, these figures were obtained well before conditions dramatically deteriorated. Gaza is a land of youth. About 45% of the population is 14 years old or younger and about 60% are 19 years and younger, political economist Dr. Sara Roy said. With such a young population facing constant violence, the long-term effects are incalculable. 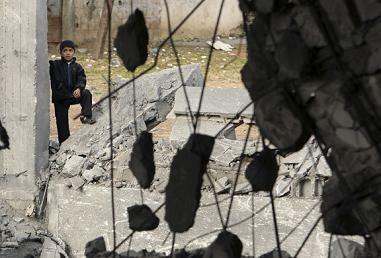 Recent studies by international researchers and the Gaza Community Mental Health program revealed more worrying figures. Of a representative sample of children in Gaza, more than 95% experienced artillery shelling in their area or sonic booms of low flying jets. Ninety-four percent recalled seeing mutilated corpses on TV while some 93% witnessed the effects of aerial bombardments on the ground. More than 70% of children in Gaza said they lacked water, food and electricity during the most recent attacks, and a similar percentage said they had to flee to safety during the recent attacks. Additionally, 98.7% of the traumatized children reported that they did not feel safe in their homes. More than 95% of the children felt that they were unable to protect themselves or their family members causing a feeling of utter powerlessness only compounded by a sense of loss over the lives they could have had, safe and boring lives that many take for granted. A whole generation is being lost to the horrors of large-scale military violence and a brutal occupation. In front of many distraught members in the audience, Kanter described another study that showed that witnessing severe military violence results in more aggression and antisocial behavior among children, along with the “enjoyment of aggression.” There are similar studies among Israeli children who witness terrorist attacks. Post Traumatic Stress disorder, Dr. Kanter said, is an “engine that perpetuates violent conflict.” It leads to three characteristic symptoms. The first involves reexperiencing the traumatic events in the form of the nightmares, debilitating flashbacks, and terrifying memories that haunt people for years afterwards. Other people may develop avoidance symptoms in which they become isolated and emotionally numb, deadened to the world around them. The third symptom involves hyper arousal, which may lead to excessive anger, insomnia, self-destructive behavior, and a hypervigilant state of mind. Other maladies like poor social functioning, depression, suicidal thoughts, a lack of trust, family violence are all associated with PTS. most recent attacks, and a similar percentage said they had to flee to safety. The most recent study however, revealed that in the aftermath of the most recent assault on Gaza an unbelievable 91.4% of children in Gaza displayed symptoms of moderate to very severe PTS. Only about 1% of the children showed no signs of PTS. Try to imagine an area with this many people—the city you live in for example—where 9 out of 10 children exhibited symptoms of Post Traumatic Stress. What would daily life be like? What would the future hold for your city’s youth? Particularly horrifying about the situation is that there is no “post” trauma for most in Gaza. Whereas soldiers who endure traumatic experiences in a war zone can return home to relative calm and seek treatment, the people in Gaza continue to held in what one Israeli rights group labeled the “largest prison on Earth”—a methodically “de-developed” island of misery isolated from the rest of the world. The fate of the 1.5 million “unpeople” trapped there is of no concern to the occupying army or its international backers. This will be the enduring legacy of the Israeli occupation. One of the most distressing prospects for peace are studies of similar war-torn populations like Kosovo and Afghanistan that showed that military violence often leads to widespread feelings of hatred and the simmering urge for revenge. One can easily predict the future consequences of a large number of young people exposed to this level of trauma. As Dr. Eyad El-Sarraj warned soon after the offensive, Palestinian children in the first intifadah 20 years ago threw stones at Israeli tanks trying to wrest freedom from Israeli military occupation. Some of those children grew up to become suicide bombers in the second intifadah 10 years later. It does not take much to imagine the serious changes that will befall today’s children. Women in the war zone are have a unique perspective to share, yet their story is an all too familiar narrative: violence that leads to anger, vengeance, and the destruction of the bonds that tie a society together. Tihani Abed Rabbu, a mother who lost her teenage son, brother, and close friend, spoke of her fears: What worries me is the safety of my family, my sons and my husband. My husband is going through a difficult time, a crazy time. He wants to affiliate with Hamas, he wants to get revenge after what they [Israel, I think] have done to us. How do you expect us to be peaceful after they have killed my son and turned my family into angry people - as they refer to us, "terrorists." I cannot calm my family down. Chris Hedges, former New York Times Middle East Bureau Chief, reminds us that, A father or a mother whose child dies because of a lack of vaccines or proper medical care does not forget. A boy whose ill grandmother dies while detained at an Israel checkpoint does not forget. All who endure humiliation, abuse and the murder of family members do not forget. This rage becomes a virus within those who, eventually, stumble out into the daylight. Despite some positive steps towards regaining some sense of normalcy, mostly from small non-governmental groups and international activists, the crushing siege continues and basic conditions of life continue to deteriorate. For many, hope is fading. Despair is spreading. “The breakdown of an entire society is happening in front of us,” Harvard specialist Sara Roy warned. Many share Roy’s fears that “What looms is no less than the loss of entire generation of Palestinians,” which she fears may have occurred already. 7. ’Sara Roy - Beyond Occupation” Australian Broadcasting Corp. October 14, 2008, Part 17, 1:03:00 http://fora.tv/2008/10/14/Sara_Roy_Beyond_Occupation#fullprogram 8. Gaza Community Mental Health Program http://www.gcmhp.net/ Additional figures from recent studies reveal the following conclusions (from a June 3 press release): •66.6% of the children appeared to have some symptoms of anxiety and psychological fears. 42.0% of the children expect events similar to those they passed through. •36.4% of the children feel disturbance and tension when experiencing events reminding them of the tragic war. •98.5% of children did not feel secure during the war due to their sense of powerlessness to protect themselves and the inability of others to protect them. •61.5% of the parents indicated the emergence of unusual behaviors among their children (such as continuous crying, and restlessness). •40.6% of parents indicated that their children have problems with their peers. 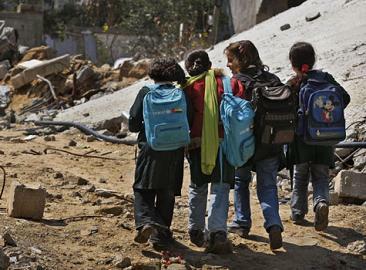 •82.1% of the children expressed their conviction that Gaza is an unsafe place. •73.5% of the children had fears of being targeted and killed. •76.6% of children had fears of occurrence of what happened to them during the war.